Many who see this for the first time are shocked. Not many traders talk about it. For good reasons. This is a must read for all clients doing the Double in a Day Entries one-on-one course. I will help most of you with this technique at some stage of the course. Many traders are pretty good at spotting horizontal support and resistance. Many traders however are missing out tremendously on the real way support and resistance is structured in the Forex market. Channel trading only goes part of the way and so far in the course we have focused on channel trading. 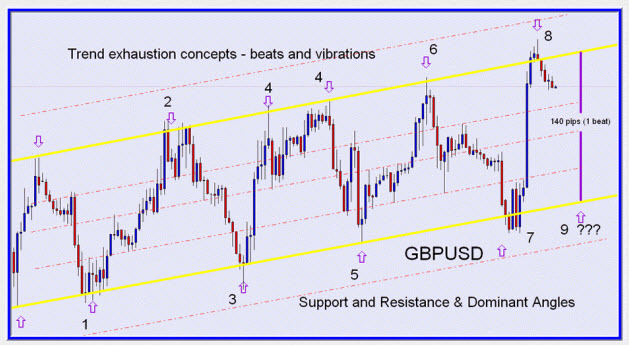 Channel trading is a great introduction to DOMINANT ANGLES which is covered in the more advanced modules. In fact, the same angle of non-horizontal support and resistance repeats itself over and over again so often that every currency has a dominant up angle and a dominant down angle of non-horizontal support and resistance. The dominant angle support and resistance lines are tradable in exactly the same way a horizontal support and resistance. In fact, they can be traded along with horizontal support and resistance to create great bounce and breakout trade opportunities. It is easier to identify confluence areas. Dominant angles form the basis for finding long candles (Our Long Candle Course) which are ideal for Double in a Day trading. They can be used to identify non horizontal supply and demand areas. When you see them for the first time you start thinking that there is some Forex market Manager managing the Forex market price action all the time. Expert4x has been teaching Dominant angle trading for years and have a few videos and articles on the subject. Why not view the articles and videos by Clicking on this link?